Despite saltash.net’s geographical distance from London, opportunities for students and staff to visit the nation’s capital are frequent. Recent enrichment activities have included all of Year 10 undertaking a Theme Day journey in March either to the Tate Modern and Tate Britain or to the Natural History and Science museums in Kensington. 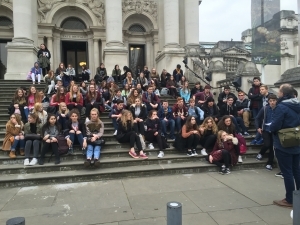 During the month of April, Head of PE, Mr Rob Hawkins, and teacher of PE, Mr Dan Budd also travelled to London with a group of forty five gifted and talented students from across years 10 to 12. The purpose of their visit was to see first-hand the Queen Elizabeth Olympic Park. 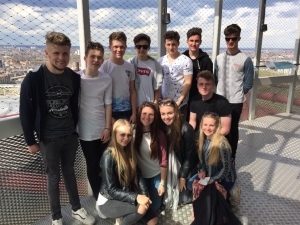 Blessed with good weather, the students spent the day exploring the Velodrome, Copper Box arena, stadium and Aquatic centre. Led by London’s Blue Badge Guides, the highlight of the tour was a trip to the top of the ArcelorMittal Orbit, the largest sculpture in the UK with a height of 115 metres. Mr Budd returned to London last weekend to run in the Marathon, the ninth time he has competed in such an event. Mr Budd was raising money for the Brain Tumour charity through his involvement in the event.